Prime Minister Stephen Harper used Sunday's opening of the G7 summit to push European leaders to ratify the comprehensive Canada-EU free trade agreement. Harper's office said he talked up the trade pact at the G7's first working session of the day on the fragile global economy. Prime Minister Stephen Harper used Sunday's opening of the G7 summit to push European leaders to ratify the comprehensive Canada-EU free trade agreement. Harper's office said he talked up the trade pact at the G7's first working session of the day on the fragile global economy. "Prime Minister Harper encouraged European members of the G7 to swiftly implement the job-creating Canada-EU trade agreement," his office said in a statement. Harper met European Council President Donald Tusk, and the European Commission President Jean-Claude Juncker, where he was expected to push the deal. Harper said nothing about the trade deal going into the meeting, and did not meet with the travelling Canadian media on the first day of the summit, holding two photo-ops that lasted barely a minute in total. Canada and the EU have an agreement in principle on a sweeping pact in goods and services but the legal text still needs to be finished so it can be ratified by Canada and the EU's 28-member countries. Ratifying the pact, known as CETA, would be a major political win for Harper with the planned Oct. 19 federal election looming. 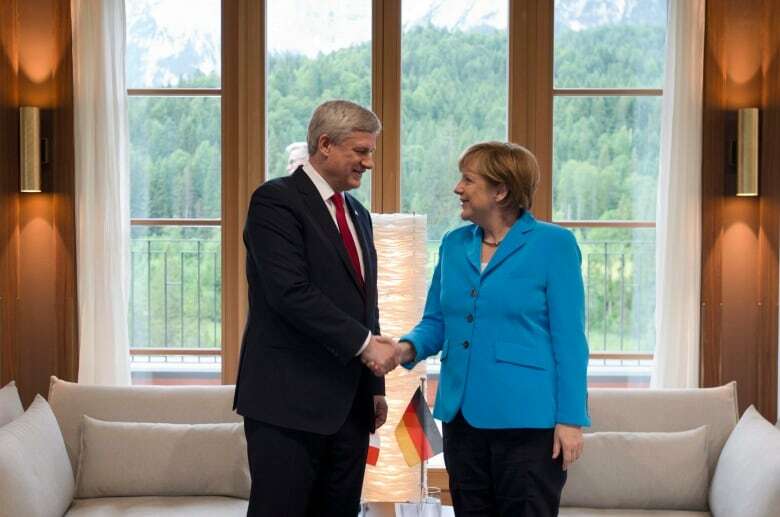 Heading into a meeting with German Chancellor Angela Merkel, Harper said nothing about the pact, but his office said prior to the summit that the prime minister would be using all his meetings with European leaders to push for it. Harper also met with British Prime Minister David Cameron, and they discussed the need to grow the fragile global economy as well as addressing two of the world's leading security issues: the crisis between Russia and Ukraine, and the fight against the Islamic militants in Iraq and Syria, said his office. They emphasized the need for Russian President Vladimir Putin to honour the Minsk peace agreement that was seriously undermined by a renewed outbreak of violence in eastern Ukraine this week. "The two leaders reiterated the importance of maintaining a firm and united stance on Russia's aggression in Ukraine, and urged Putin to respect and implement the Minsk Agreement," said Harper's office. Harper arrived in Germany's scenic and mountainous Bavarian region for the G7 after stopping in Kyiv and assuring Ukrainian leaders that he would push for solutions to their ongoing conflict with Russia. Merkel and U.S. President Barack Obama also presented a united front, affirming the need to maintain sanctions on Russia. "The duration of sanctions should be clearly linked to Russia's full implementation of the Minsk agreements and respect for Ukraine's sovereignty," the White House said in a statement after their meeting. About 400 protesters made their way up and then back down the mountain where the summit is being held after failing to breach the security perimeter around the German alpine hotel where G7 leaders are meeting. "We didn't make it in, but I think we sent a message that the world leaders are hiding from the people," said protester Micha Schmid from Bavaria. Walking through an alpine meadow in full bloom, he added "and this was definitely the most beautiful protest I've ever been on." After a 2½-hour uphill hike and a two-hour standoff with police, dozens of activists stopped for beer and sausages at a 300-year-old guest house before making the final descent to the resort town of Garmisch-Partenkirchen. Police in heavy body armor looked on hungrily for a while before leaving the protesters to enjoy their refreshments. About 17,000 officers have been deployed around the summit venue, a former Winter Olympic Games venue at the foot of Germany's highest mountain, the Zugspitze. Another 2,000 are on stand-by across the border in Austria. Crises in Ukraine and Syria and debates over the global economy and climate change are overshadowing the G7 summit — but the immediate outlook for the leaders there is idyllic. The leaders of Germany, Britain, Canada, France, Italy, Japan and the U.S., along with European officials, posed for photos Sunday in a sun-soaked, flower-strewn meadow before getting down to work inside the secluded Schloss Elmau hotel. Merkel is hoping to secure commitments from her G7 guests to tackle global warming to build momentum in the run-up to a major United Nations climate summit in Paris in December, but she will need to overcome resistance from Japan and Canada.